Næste stop. Next stop, the pre-programmed bus announcer calls out. Easy to not pay attention with the free wi-fi afforded on public transport here. One of the many reasons that we have decided to go car free. Car-free… as free as the wind blows as free as the grass grows. We did it. We turned in the mini-lease on the Nissan Leaf. Like trying on 57 different swimsuits in a desperate attempt to procure the one that might, just might, play up your assets and veil your challenge zones, we were trying on cars. The Leaf just last in a line of rental vehicles that, like the suit I still am looking for, just don’t quite work. 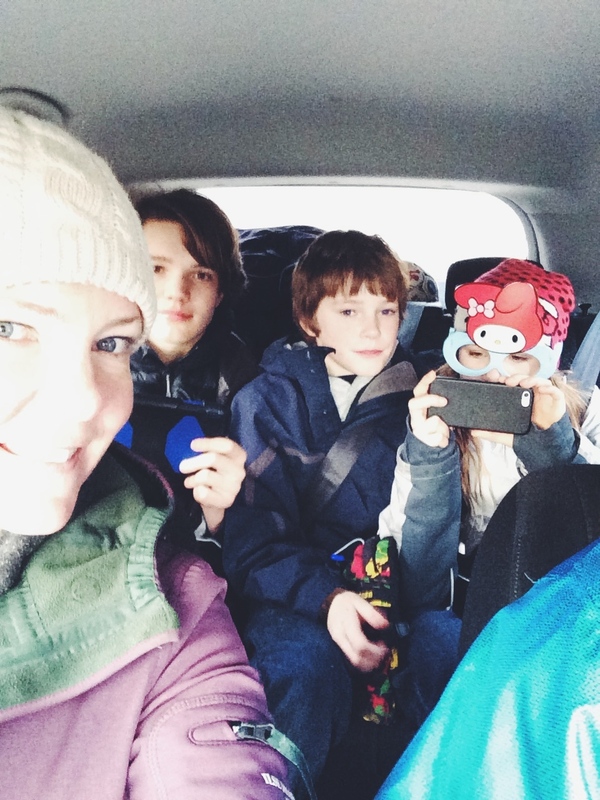 With three children – my eldest already taller than me at 14 – finding a car that fits us all here has proven challenging. No big ‘Merican SUV’s cruising around here. Parkering would be interminable if there were. I don’t think my old Ford Explorer would fit down the cobblestoned streets or in any of the available parkering spots. Maybe it’s an issue of living in the city versus living in the burbs. Truth ink that the further you go from old city the larger the personal vehicles become – true anywhere? Certainly comparable back in the States. I would never have considered going car free living in our Portland suburb. Too many soccer (ahem, football), lacrosse, football, dance, practices, games, events for shuttling children fro and to. Too many beautiful Pacific Northwest road trips to be had – how else to get to the mountain? The Oregon Coast? Football games in Seattle? Public transportation while existent there, not nearly as comprehensive and widespread as here. And while we were here finding our way round and squishing into small backseats – the consistent cries of “I’m NOT MIDDLE!” and the subsequent elbow battles and “He’s in my space!” echo not so quietly or too far back in recent memory – did we slowly start to find that public transportation was terribly easy and convenient… and potentially spacious. My husband will tell you, should you ask him, that he was promoting a car free Danish existence much earlier than I was ready to accommodate. I was terrified to be honest. Why? You may ask. Hard to define. But something akin to having your wings clipped. Fear of the unknown? What would that life look like? Would it constrict us? As it turns out, I think the car has been the constrictor. Holding us back. For example. The children are able to stretch their wings now. Kissing goodbye from the landing of our 5th floor apartment – the boys head off for their early days at school (not the same day unfortunately) solo and unaccompanied. They have to walk a few blocks to the public bus stop, swipe their prepaid Rejsekort (travel card) to start their journey. They get off at the S-tog station and transfer to a train, clicking their rejsekort again – making sure that the line they want is going the correct direction, else ending up cruising the opposite direction. Of all the family members (besides the wee lass who has yet to make a solo flight) it is I. Myself. It is me who has blundered the transport the grossest. Now tell me this. All the busses heading in our direction are labeled 1A. About 1 in every 5 of them don’t have the same final destination. Couldn’t you call that bus 1B? No? Why not? Those who know say it’s obvious because the final destination is clearly marked on the bus marquee in front. I didn’t know. Anyway – now I know. It was concretely embedded a few months ago after I jumped on the wrong one and while standing out in the burbs – too far to walk to where I needed to meet the children in time, I waited on the other side of the street for the return bus. Much less frequent and far in between this return would be – remember I said in in every 5 goes out there. The children luckily pooled together and adding two and two assessed that mom didn’t have the car this particular day (as Dad had taken it to Aarhus) and waited patiently for me at the school. No more waiting now. They can text me and use their own rejsekort and make their own way home. Brilliant. The freedom of knowing that I’m not getting a parkering ticket because I parked in the wrong space or didn’t put enough time on the meter is unfathomable. The ease of getting into the city a breeze. The grey-hair inducing act of actually driving here in Copenhagen – which is something akin to Frogger or Crossy Road without the animals – OVER. Imagine trying to turn across bike lanes (which have their own traffic lights) with throngs of bikers only to meet on the sidewalk a myriad of giant-pram wielding, grocery-laden or dog-walking pedestrians and then trying to maneuver around giant delivery or garbage trucks – not even to mention the construction, construction, construction – EVERYWHERE. My anxiety levels while driving and trying to manage the “he’s in my space!” from the backseat were high to say the least. Riding the bus or train is like a dream. I can post to my Instagram (or @expatindenmark’s Instagram which I was flattered to be asked to takeover this week.) I can catch up on you on Facebook, I can read a book. I can chat with my children and hear about their day when I ride up and gather them from school or while delivering them in the morning. It’s delightful. Seriously. Follow your own path – or the one clearly outlined for your by this awesome app. Since moving to Asia, I really feel that we’ve got it all backwards in North America. You really actually NEED a car to get around and get things done, because appropriate thought and resources have not been put into public transit. The subway system etc… is so good, affordable, safe and clean here in Seoul, that it doesn’t make sense NOT to use it. I actually let my drivers license expire here! In London after a couple of years we got rid of our car, we only used for food shopping, so it wasted more money than anything. After we moved back to the US, my daughter couldn’t stand driving in a car for too long, she missed walking and taking the bus & trains, since this was all she ever knew. Unfortunately in AZ we must have a car.